As many as 20% of Americans experience anxiety when visiting a dental office. 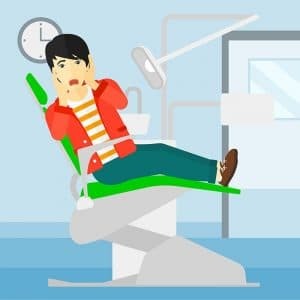 While most dental procedures aren’t painful, a bad dental experience from the past can sometimes haunt us for the rest of our lives. If you are among those panic-stricken when the word “Dentist” is even mentioned, you can find comfort in knowing that all dentists at Dental365 have been specially trained on how to accommodate patients with dental phobia. Dental365 also offers sedation dentistry at certain locations. Gently explain what the patient will feel, and for about how long. Frequently ask the patient for permission to continue. Give the patient the opportunity to stop the procedure at any time the patient feels uncomfortable. Make time for breaks when needed. If you are still unsure about seeing a Dental365 dentist, just read a review from one of our patients with Dental Phobia. It is very important to overcome your dental phobia as soon as possible. People with dental phobia have a higher risk of gum disease and early tooth loss. Avoiding the dentist may have emotional costs as well. Discolored or missing teeth can make people self-conscious and insecure. They may smile less or keep their mouths partly closed when they speak. Some people can become so embarrassed about how their teeth look that their personal and professional lives begin to suffer and there can be a serious loss of self-esteem. Go to that first visit with someone you trust, such as a close relative or friend. Seek distraction while in the dentist's chair. Listen to music or watch Netflix. Every Dental365 operatory is equipped with a flat-screen internet tv that includes Pandora and Netflix. Review with your dentist which sedatives are available or appropriate.